**Freight charges not applicable in Hawaii. Additional charges for shipping to Hawaii. The new CTC Double (Double size version of the Compact Tent Cot) from Kamp-Rite folds down to an easy-to-handle 45"x12"12" package that weighs 44 lbs. The CTC Double sets up in seconds and provides a comfortable ambient sleep. Two zippered polyester and mesh entries affords easy access to either side of the fully enclosed 85" x 55" sleeping area. Two overhead zippered windows provide air flow on warm nights. 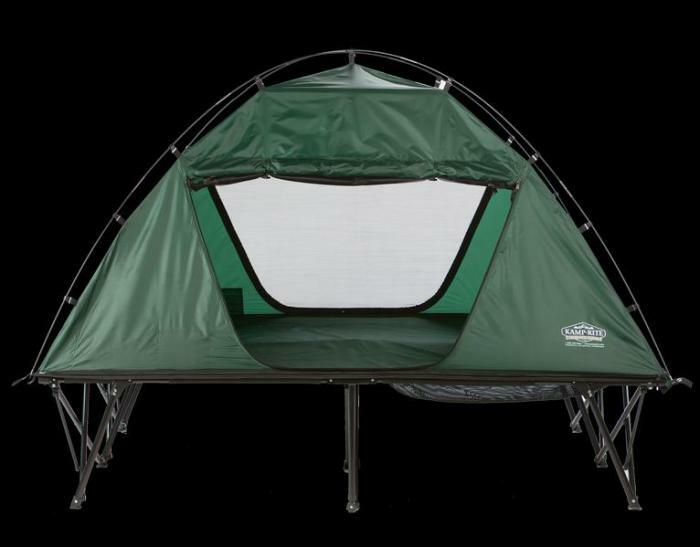 The tent top portion of the CTC Double zips on and off of the base and can be used separately on the ground as a standard tent. The bottom base cot of the CTC Double can then be used independently as a one or two person sleeping cot. The CTC Double is a truly innovative, unique "3 in 1" product. Weight capacity: 550 lb. My wife and I love the tent cot! It was pretty chilly outside the first night we slept in it. We ended up opening the windows it stayed so warm. The rain fly is an excellent addition to this item. You can set the tent cot up in 5 minutes by yourself. We are looking forward to many more comfortable nights sleeping in this thing. I think the tent cot will be great this summer and I can't wait to use it. It's too cold today for us to use it but it will not be long and we really will try it a lot. I am very impressed! I'd been dreaming about this one for a while. I want to sleep in my garden this summer. This makes it easy and keeps me off the ground; it will be great. The tent cot is great. We love it. This is very roomy, easy to setup and compact.